The Daily Palette celebrates the talents of MA and MFA students as they move toward graduation! 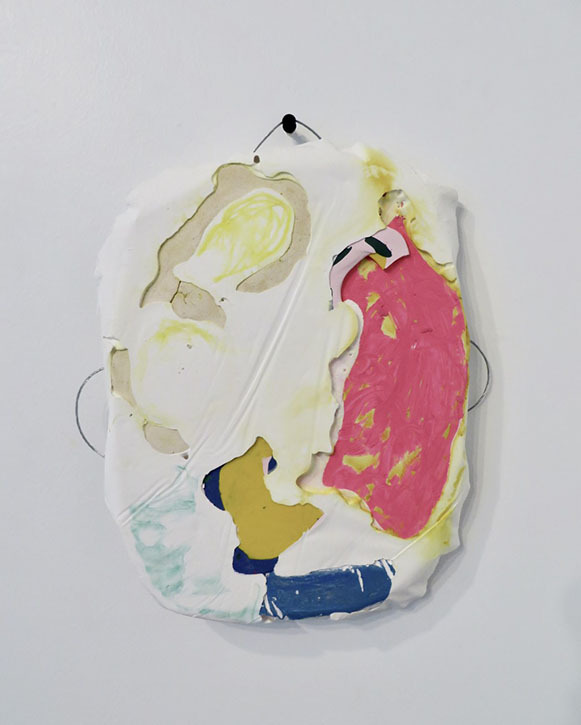 Claire Whitehurst is an artist living and working in Iowa City, Iowa, where she is teaching and pursuing her MFA in Painting at the University of Iowa. She earned her BFA from the University of Mississippi, and a Post Baccalaureate degree from the Pennsylvania Academy of Fine Art in Philadelphia, PA. Her work can be found in private collections throughout the United States, and abroad in France and Germany. She has permanent public commissioned installations in the Performing Arts Center of Jackson Academy in Jackson, Mississippi, and in St. Jude's Research Hospital in Memphis, Tennessee. Her work explores physical and psychological relationships, and the construction of ambiguous narrative through shape, symbols, color, line, and rhythm. This piece is an arrested moment of accumulation that comes from another world similar, yet foreign to the one we know as our own. I make objects, and break them to form fragmented compositions of chaos and of order, in their shape and color—colonies of broken relics assembled as a cluster, then cast between one another indefinitely. The objects that result in this process are inviting to the hands and eyes—candy apples floated in milk, but set in stone. I am interested in contradictions of weight, space, and form to trick the eye and surprise the hand.